Floride, sur le golfe du Mexique! Les attractions de la Floride. L'aéroport de Tampa 45 minutes, 90 minutes de Disney, Busch Gardens 45 minutes. Nous ne sommes que 2 min. de la clinique BONATI. 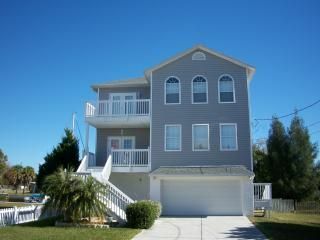 This house is perfect for many different vacation needs. You can fish from the dock, Swim in the pool, go for walks and watch the dolphins. Walk to Sams for dinner and entertainment. Great kitchen for cooking and plenty of space to spread out and relax. owner plays nice until after you get home almost two weeks home receive a call back and he request you to be fair and request to keep your whole deposit after declining his request he still sent a check for only 50 % of my refund....I handled the fleas inside and out, and had to trim bushes to clear the stair way to the front door, good thing we had our own handyman. overall the home was great, BUT DONT PLAN ON GETTING YOUR DEPOSIT BACK. Beautiful home - very conscientious homeowner. High Season (November 15 to April 15): 1-2 person occupancy is $950 per week/$3000 per month Note: During High Season we generally prefer to rent a full month, but sometimes can make alternate arrangements for shorter stays. Off Season (April 15 to Nov. 15): 1-2 person occupancy 850 USD per week/$3000 per month. Rates are based on 2 person occupancy. Each additional person is $50 per person, all dates can be negotiated.